Vietnam’s local garment industry, which until now did not have much of a role to play, has revamped its production process to join the global supply chain, experts said. Vu Duc Giang, chairman of the Viet Nam Textile and Apparel Association (Vitas), said the local garment industry had been one of the leading industries in export value but the industry had just joined the processing stages of cutting and sewing in the global supply chain. The industry depends on imported material from abroad, especially from China, which accounts for 50 per cent of the material for the industry’s production, according to Giang.However, if the markets providing material for VietNam’s garment industry show any abnormal fluctuations it impacts the local industry adversely. In addition, the local textile and garment sector has not seen much co-operation between manufacturers to create a production chain and a sustainable development strategy in the long term. 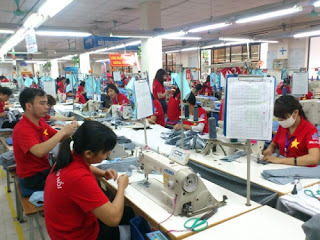 Tran Thu Hien, director of Nha Be Garment Corporation’s branch in Ha Noi, said Viet Nam’s garment enterprises had focussed on developing their strengths. They had not paid attention to demand or the lack of raw materials and had not sought ways to ensure the supply of raw materials, and had instead depended on imports, she said. The Nha Be Garment imports 70 per cent of its material for production while it sources 30 per cent of the material from the local market. Truong Thi Thanh Ha, general director of Dong Xuan Knitting Ltd Company, said Viet Nam required 400,000 tonnes of cotton each year, but the local market supplied 3,000 tonnes, and the remaining had to be imported from other countries.”Most of the machines, chemicals and textile dyes that Viet Nam’s garment industry uses needs to be imported. That means the supply chain remains the weak point in Viet Nam’s garment sector,” Hasaid. Phan Chi Dung, head of the Light Industry Department under the Ministry of Industry and Trade, said the development of the world garment industry would result in the development of supply chain and e-commerce transactions.These were challenges for the local garment sector so it must reform itself in future, he said. However, 21 per cent of small- and medium-sized enterprises (SMEs) in Viet Nam had joined the global supply chain, which is lower than Thailand and Malaysia, where 30 per cent and 46 per cent, respectively, of SMEs are part of the chain.”Vietnamese enterprises have joined the lowest stages of the supply chain of processing and supply of alternative parts, not major production stages such as production of materials and design,” he said. Giang said that to increase added value of the garment industry, its enterprises must focus on developing production of material and changing production methods. These solutions would improve the quality of exported textile and garment products and encourage co-operation among garment enterprises to create a domestic supply chain, he said.Le Tien Truong, general director of the Viet Nam National Textile and Garment Group (Vinatex), said the local textile and garment firms should change its strategies in production and management and develop skilled workers to create favourable conditions for firms shifting the production modality from Cut-Make-and-Trim (CMT) to free-on-board (FOB) practice and Original Design Manufacturer (ODM), reported vietnamplus. Vinatex has planned investments in a series of plants in central Ha Tinh province to form a competent production chain serving domestic and foreign markets. At a total capital of nearly VND1 trillion (US$45.14 million), four factories, wastewater treatment, and water supply centres will be built in the local Nam Hong industrial park, covering 19 hectares. The construction of two sewing plants, Hong Linh 1 and 2, costing VND190 billion ($8.6 million), will start in February 2016 and early 2017. In late 2017, the Hong Linh plant for scarf weaving, with designed capacity of 1,500 tonnes per year, will be built under a VND314-billion ($14.17 million) investment. The last of the four is a factory for dyeing and knitting worth VND410 billion ($18.5 million), which is capable of turning out 1,400 tonnes of products annually. Vinatex has launched a drive to increase productivity which is vital when the country accelerates international integration.